It's finally been a year since the release of the stellar first season of Marvel's Daredevil on Netflix, and the second installment is finally upon us! With a diverse cast of new and returning characters, a growing universe of Netflix crossovers due to Jessica Jones, as well as possible crossovers with Agents of S.H.I.E.L.D. or other entries in the Marvel cinematic universe, there’s a lot more to follow than there was last season. In order to track of the various characters' comings and goings, we present to you the Daredevil Season 2 Character Guide. This guide is in alphabetical order and will be updated as more information about each character is made available, so stay tuned. In the Marvel comics, Blake Tower becomes District Attorney after campaigning against Foggy Nelson. He has many interactions with various heroes from all over the Marvel universe, and is even involved in the trial of Bucky Barnes over the war crimes he committed as The Winter Soldier. Blake Tower is the assistant District attorney under Samantha Reyes, and frequently serves as her errand boy in dealing with matters such Nelson and Murdock’s involvement with Elliot Grotto’s case. He regularly sides with Reyes on most issues, but he clearly respects what Nelson and Murdock are trying to accomplish and occasionally throws them a bone, going so far as to slip Karen Page the DA office’s entire Punisher case file. Brett Mahoney is a police office in Hell’s Kitchen, and childhood friend of Foggy Nelson. Mahoney occasionally tips off Nelson and Murdock to unique cases as thanks to (or in spite of) Foggy’s regular gift of cigars for Mahoney’s mother, Bess. 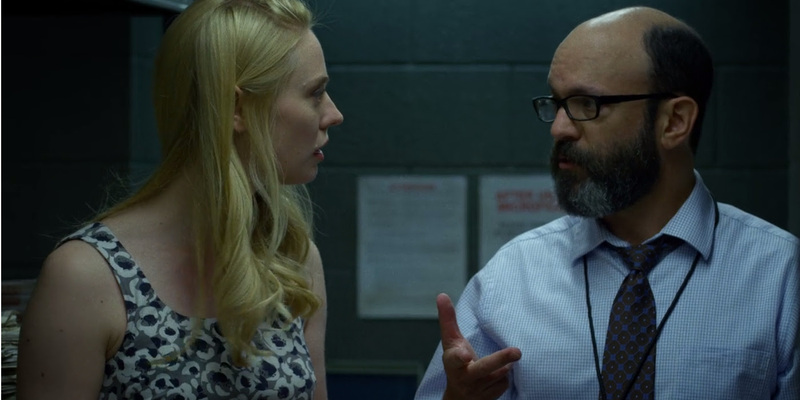 Mahoney is one of the only clean cops that Matt and Foggy can trust, and he's integral to the eventual exposure and capture of Wilson Fisk. When Jessica Jones attempts to get herself arrested by taking the severed head of her dead neighbor in to the police station, she finds Mahoney and the rest of the precinct already under the control of Kilgrave. The mind-controlled Mahoney tells Jessica she’s free to go, then laughs the whole situation off. Claire Temple is a nurse that first meets Matt Murdock when he’s laying in a dumpster after being badly beaten by kidnappers. She immediately identifies him as the source of the increased traffic of injured thugs to the emergency room she works in. He allows her to treat his wounds, and she promises to keep his identity a secret. Daredevil’s penchant for pain makes Claire’s skills invaluable, but he’s not the only hero to received treatment from the night nurse. She’s on call when Luke Cage is brought to the emergency room (after a shotgun blast to the face scrambles th inside of his skull, even if his face is left unblemished), and assists Jessica Jones in sneaking him back to Jessica’s apartment so his abilities won't be discovered. So far, she’s the connective tissue between the characters that will eventually form the Defenders. Blinded in a tragic accident that also gave him super radar senses, Matt becomes an orphan after his dad is killed by criminals. He soon encounters Stick, a blind martial arts master who teaches him to better harness his advanced senses and master many forms of combat. Matt goes on to graduate from law school and open a storefront legal clinic with his best friend and college roommate, Foggy Nelson. He also puts on a mask and beats up criminals at night. This practice quickly lands him in the middle of a gang war, eventually leading him to learning about the Kingpin - Wilson Fisk. As a devout Catholic, Murdock is heavily conflicted over the violence he inflicts on others. He knows he is called to fight evil, but doesn’t know at which point his actions cross the line. Growing to accept his role as a vigilante, he’s has a new armored suit and horned helmet constructed, taking on the title of Daredevil. Matt Murdock and Elektra met in college where he took a Spanish class for the express purpose of meeting girls. His tactic worked and they briefly dated, but it didn’t last. In the Marvel comics, Elektra’s father, a Greek diplomat, is kidnapped by terrorists and killed due to a botched rescue attempt by Matt, causing her to flee the country. Elektra studies martial arts in China, where she’s approached by Matt’s old master, Stick, who desires to train her. There’s a darkness inside Elektra, and it isn't long before she leaves Stick and his organization, training instead with his opponents, The Hand, before moving on to a solo career as a freelance assassin. Father Lantom is a priest in Hell’s Kitchen who regularly takes confession from Matt Murdock. He see’s the turmoil inside Matt, and takes his guidance of Murdock very seriously. Matt’s night time habits tear at his moral compass as he wants to punish criminals, but doesn’t want to be damned himself in the process. Lantom often gives Matt sage advice for his moral and spiritual well-being while encouraging him to keep up the good fight. Given that Daredevil's moral compass is set to be tested by the Punisher in this season, you can be sure Father Lantom will be there to offer counsel to Murdock. Foggy originally met Matt at Columbia law school, where they were roommates. They became fast friends and stuck together after college, eventually starting their own small firm Nelson and Murdock. Although he likes to lament the duo’s decision to pursue a far less lucrative law career than a bigger firm could have provided, Foggy has a heart of gold. He throws himself fully into every charitable case that come his way. This passion leads him to team up with Karen Page to aid in her investigation of Union Allied Construction, which turns out to be a major component in the exposure of Wilson Fisk. Grotto is the sole survivor of an attack on the Irish mafia conducted by the Punisher. 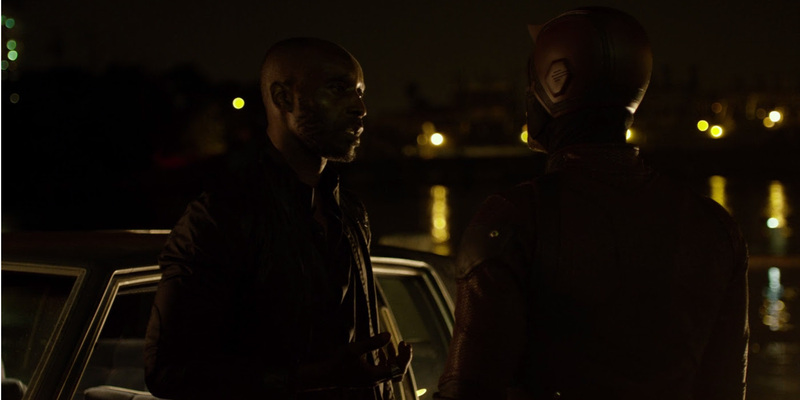 He goes straight to Nelson and Murdock for protection, instigating their investigation of Frank Castle. Elliot is a career criminal, but appears to feel immense guilt over his choices, often trying to buy his salvation by putting hundred dollar bills and rolexes into the offering plate when he attends Father Lantom’s church. Punisher plans to use Grotto as a teaching opportunity to educate Daredevil on the necessity of Punisher’s brand of justice. Daredevil is presented with a murder-or-allow-murder false dichotomy, to which he chooses option 3. He doesn’t kill Punisher, but he still fails to prevent Grotto’s death. Karen Page first meets Matt and Foggy when they pick up her murder charges as Nelson and Murdock's first case after graduating law school. A former secretary for Union Allied Construction, she had been framed by them after discovering some financial discrepancies in their books. Matt and Foggy are able to get the charges dropped, and Karen decides she wants to work with them as their secretary. For free, of course. Desiring to get to the bottom of why she was framed, Karen begins an investigation of her own, working with Foggy and Ben Urich to determine why that financial discrepancy caused such a stir, only to discover that it goes all the way to the top. Karen’s persistence in discovering the truth ends up being a key driver in the exposure of Wilson Fisk as the Kingpin. Wilson Fisk is a ruthless businessman who is secretly the Kingpin of crime in Hell’s Kitchen. Similarly to Matt Murdock, he wants to clean up the city, but is uncompromising in his ends-justify-the-means approach. Fisk's criminal associate, Madame Gao, tells him that he cannot be both “savior and oppressor,” and he must choose between “light and shadow,” or he will be defeated. When Leland Owlsley poisons Fisk's new Fiance, Vanessa, in an attempt to refocus Fisk on the task at hand, Fisk lets the shadow win over. He kills Owlsley, setting a fail-safe into motion that allows Daredevil to expose Fisk’s entire operation, leading to a showdown with the Devil of Hell's Kitchen and a trip to Riker’s prison. Gao is an associate of Wilson Fisk who runs the heroin trade in Hell’s Kitchen. Her workers all show incredible devotion - or “faith,” as she puts it - and poke out their own eyes in order to pass as mundane blind people, openly trafficking her drugs throughout the city. Most people assume she is from China because she speaks Chinese, but she says her actual home “is a considerable distance further.” Considering China is about the farthest one can get from New York, this suggests she may hail from somewhere more mystical, possibly relating to K'un Lun, the extra-dimensional world where Iron Fist (soon to have his own Netflix series) was trained. She also knocks Daredevil across the room with a single punch, which is not a skill possessed by the typical old Chinese woman. There's clearly more to Gao than meets the eye. Mitchell Ellison is the editor-in-chief of the New York Bulletin. Although he wasn’t not caught up in the rampant corruption at the Bulletin during the reign of Wilson Fisk, he was still a cynic that regularly served as an obstacle to Ben Urich writing any hard hitting stories. His resistance to Urich’s attempts to expose the widespread corruption in Hell’s Kitchen eventually leads to him firing Ben altogether. Since Ben’s death at the hands of Wilson Fisk, Ellison has softened up and is willing to help Karen Page research the Punisher, despite a clear smear campaign against him, by giving her access to the Bulletin’s back issue archives. Potter is a savant designer forced to make lightweight protective formal suits for Wilson Fisk. He is coerced into providing this service due to repeated threats by Fisk to hurt someone close to him, Betsy Beatty. When Daredevil finds Melvin’s shop, the designer attacks him, worried his presence will anger Fisk. But Daredevil subdues him and promises to protect Betsy if Melvin makes him a new armored suit that eschews the devil imagery, allowing him to finally adopt his title of Daredevil. In Marvel comics, Frank Castle is a Marine captain who is turned into a lethally violent vigilante after his wife and kids are murdered during a public mob related killing. Vowing to avenge his family, Frank becomes the Punisher, equipping himself with powerful military equipment and waging war on organized crime. Punisher may not be a villain, but he also he doesn’t live by the same code of ethics that makes other crime fighters heroes. His antics are especially at odds with Daredevil’s Catholicism, bringing them into a fundamental conflict over whether or killing in the name of justice is... well, just. Samantha Reyes is an ambitious district attorney with a vendetta against vigilantism. She tried to prosecute Jessica Jones after the death of Kilgrave, and now has her sights set on Punisher. She has a reputation for being unforgiving and cutthroat, frequently throwing colleagues and employees under the bus to advance her own career. Reyes has a personal involvement in the prosecution of Frank Castle, and is pulling strings behind the scenes to ensure his history as a decorated war vet and the loss of his family doesn’t get into the press. She sees the prosecution of the Punisher as an excellent opportunity to establish legal precedent against vigilantism, which she hopes to later leverage against other less controversial masked heroes - such as Daredevil. Stick was born blind, but managed to master his senses, enhancing them to a level of heightened awareness that allows him to “see” without his eyes. After a nun from St. Agnes Orphanage paid him to look after Matt, he trained Matt to master his own already heightened senses to achieve a similar ability to see using his other senses. Leading Matt on an intense training regiment, he teaches him many forms of martial arts, anticipating the child will eventually become a soldier in Stick’s war, but he abandons him when he sees that Matt is starting to see him as a father figure. Turk is a lowlife criminal who has a habit of being in the wrong place at the wrong time. He was arrested by the FBI for his involvement with Wilson Fisk and sent to Rikers prison, but is back out on the streets selling weapons again. His frequent run-ins with Daredevil make him a marginally valuable source of information. Daredevil takes full advantage of this and regularly twists his arm (literally) until he squeals. 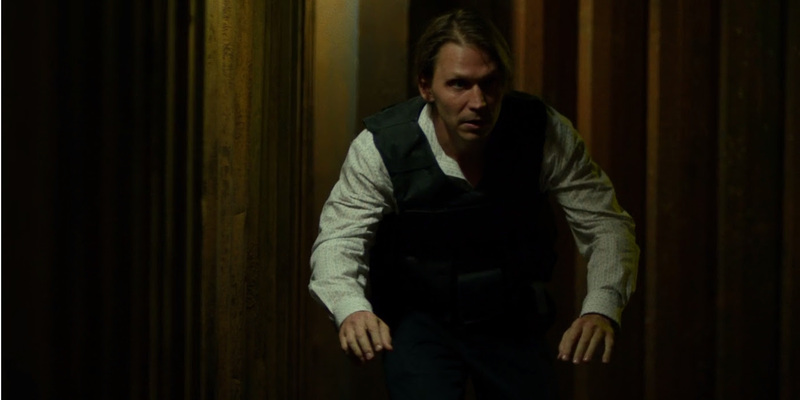 Turk is the one who originally turned Matt on to the the location of Melvin Potter’s workshop, the source of Daredevil’s armor, and also provides valuable information about Kingpin’s stolen ammo in the search for Punisher. Have you watched season 2 yet? What did you think? Did you catch any character details you think should be included in our list? Let us know in the comments!